Five years ago, the Brain Preservation Foundation (BPF) offered a challenge to the world’s neuroscientists: Preserve a mouse brain (or a mammalian brain of equal size) for extreme long-term storage. Moreover, all the neurons and synapses within it would have to remain intact and visible while viewed under a special electron microscope. This week, the BPF has announced that a project done by 21st Century Medicine and led by Robert McIntyre, a recent graduate of MIT, has won the $26,735 prize. We just moved one step closer to cryopreservation, but we aren’t quite there yet. The classic idea of cryonics—putting a terminally ill person into long-term stasis so that, when technology evolves, they could potentially be cured—is still largely unachievable. But we are working on it. So far, scientists have been trying to achieve this sort of “medical time travel” using vitrification. Vitrification uses high concentrations of something known as “cryoprotectants,” which allow tissue to solidify during cooling without the formation of ice crystals (these crystals damage cells, and effectively destroy the brain). In small brain slices, the process works well, and there is no damage to cells. However, when applied to the whole brain, brain tissue shrinks dramatically, and neural circuits are dramatically distorted. So neuroscientists funneled their resources into a more pragmatic goal: Preserving the brain’s “connectdome,” or all of its neurons and synaptic connections, only. In this way, a person’s memories and identity are stored safely. The hope is that we might one day find a way to upload the information and memories stored within an intact brain. The group from 21st Century Medicine used a combination of ultrafast chemical fixation and cryogenic storage to preserve the brain. This is the first demonstration that near perfect, longterm structural preservation of an intact mammalian brain is achievable. The subject: a rabbit brain. The chemicals aren’t just strong, they’re toxic. Glutaraldehyde, used as a disinfectant, was introduced to the team’s rabbit brain. As it spreads, the chemical stops decay and fixes the protein within the brain’s vascular system. This stabilizes the tissue and creates an intact brain that, when -135 degrees celsius, could be successfully preserved for centuries. This idea isn’t new, but this is the first time anyone’s attempted it on a brain. McIntyre says the technique was originally proposed in a book called Engines of Creation by engineer Eric Drexler, in 1986, but Drexler didn’t pursue it any further. In 2010, Greg Fahy, the chief scientific officer of 21st Century Medicine, used the technique in experiments to preserve kidneys. And then in 2014, McIntyre began to perfect the technique in small mammal brains. “Every neuron and synapse looks beautifully preserved across the entire brain. 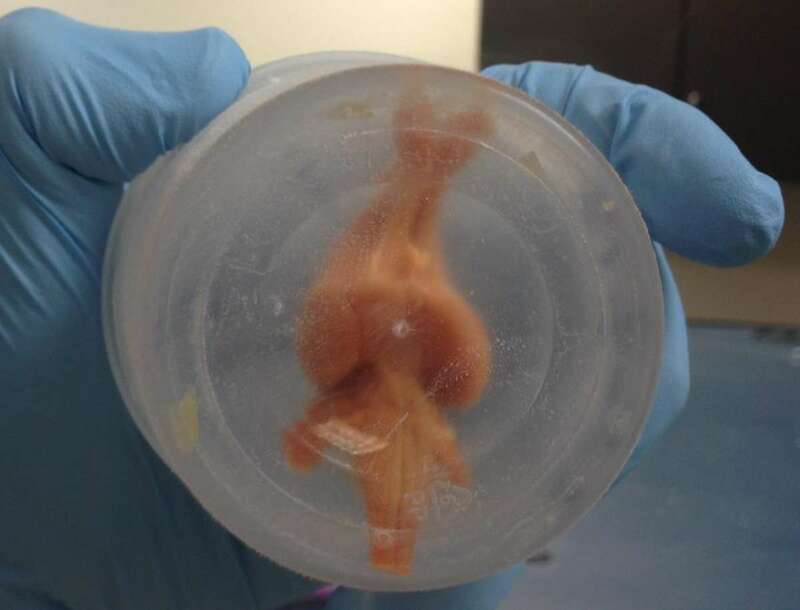 Simply amazing given that I held in my hand this very same brain when it was vitrified glassy solid… This is not your father’s cryonics,” saysBPF President Dr. Kenneth Hayworth, of the team’s brain. This research sets the stage for renewed interest within the scientific community, and offers a potential challenge to medical researchers to develop a human surgical procedure based on these successful animal experiments. In the meantime, scientists might use the technique to study how the brain works in a much more detailed way, allowing them to better understand and treat diseases. In addition, the technique could help researchers develop better artificial intelligence. With a more complete picture of the brain’s circuitry, a new model for AI could be developed. Focus for BPF will now shift to to the final phase of the contest, where the team had to preserve an intact pig brain with similar fidelity in a manner that could be directly adapted to terminal patients in a hospital setting. The 21st Century Medicine team has already submitted their pig brain for evaluation.